Faux animal busts appear to be popping up everywhere at some of my favorite home décor stores. 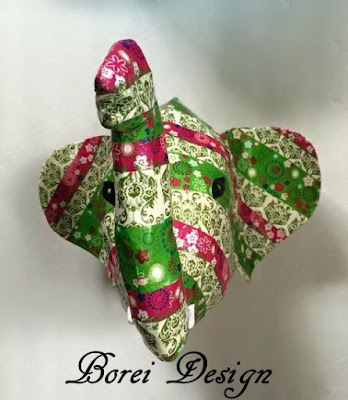 I haven’t really given much thought to the trend until I saw the adorable papier-mâché editions at Anthropolgie. Inspiration struck when I was admiring the picture of the Plains Traveler Bust Elephant. 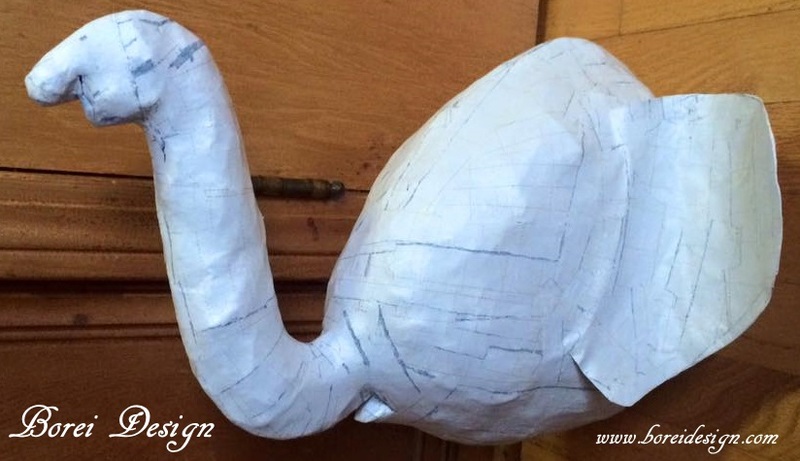 An elephant’s trunk when raised makes a natural hook where you can hang practically anything. When you add a fun pattern to the mix, you have the makings of an awesome wall accent piece that is both functional and decorative. I knew that it would be a colorful way for my daughter to hang winter scarves in her room. I set out to create my own version that was both sturdy and complimentary to the current color schemes of her room. 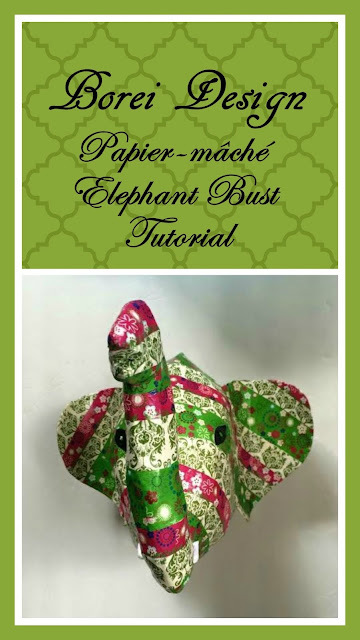 Papier-mâché is a form of sculpting where strips of paper are dipped in paste and layered to harden on a form. 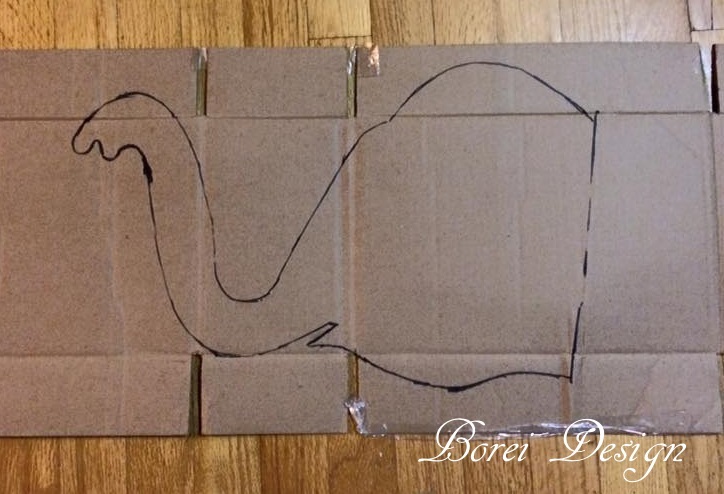 To start creating my form, I drew an elephant pattern on the back of a piece of wrapping paper, traced it on cardboard from a box and cut it out. I’m not the best at drawing but found that an elephant head is actually pretty easy to draw. 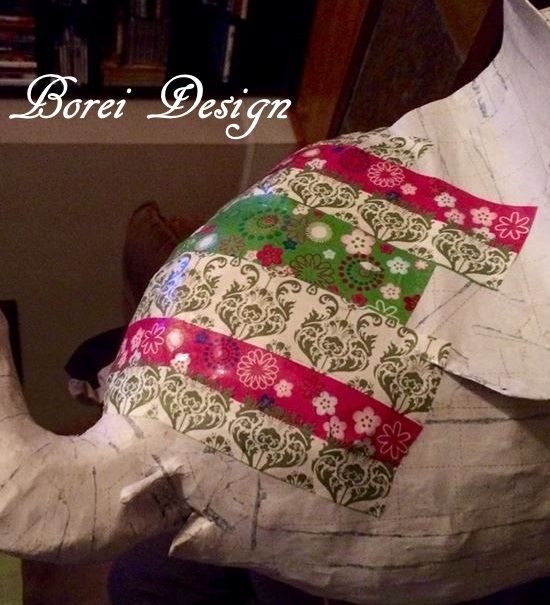 You can draw your own or you can print out a copy of my pattern, linked below. Head 1, Head 2, Trunk, Ear & Back. I then added wads of paper for padding or stuffing, dropping a bit of hot glue and adding tape here and there where needed. Pretty much any kind of paper can be used for the stuffing. 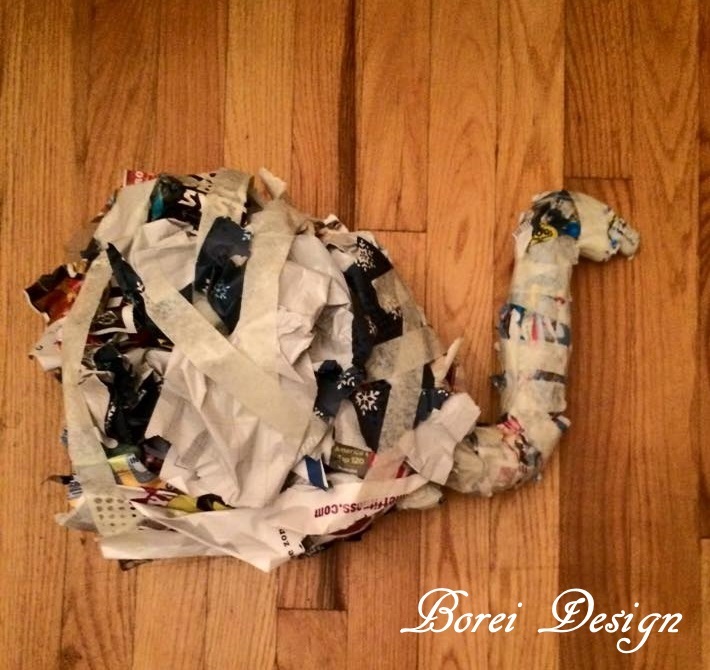 I used junk mail, wrapping paper, newspaper and even threw in some scrap copy paper. Once I was satisfied with the amount, I wrapped the whole thing with 2 inch wide masking tape and my base form was complete. 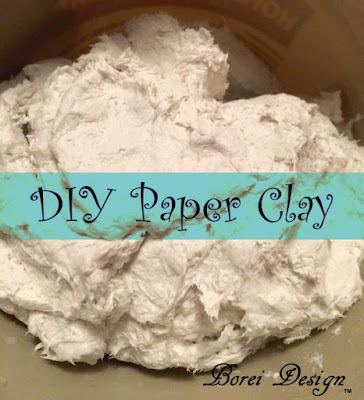 Next I whipped up a batch of papier-mâché paste. There are lots of recipes out there. I prefer this recipe over the standard, no cook, flour & water variety. Put 4 parts water into a pot on the stove and bring it to a boil. While waiting for boil, mix 1 part flour to 1 part warm water. Beat this mixture briskly with a whisk to remove lumps. Once water is boiling, slowly stir in salt (helps to combat mold & mildew) along with water and flour mixture. Mix well and let it boil for 2 - 3 minutes. The consistency should be thick and gooey. Add more flour and/or water as needed to achieve desired consistency. If you make more than you will use in one day, be sure to store excess in the fridge overnight. When ready for reuse, heat and add additional water to thin and smooth if necessary. 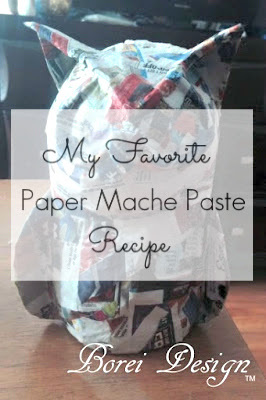 Once my paste was cooled I added several layers of wrapping paper and newspaper strips dipped in paste. Newspaper is traditionally the paper most used in paper mache sculptures but unfortunately I was in short supply at the time. Leftover wrapping paper from last Christmas worked just fine. It’s VERY important for you to allow the project to dry completely in between layers of strips. If not, the entire project will eventually mildew and collapse over time. To hasten the drying process between layers you can use a hair dryer or bake the project in the oven at 200 degrees Fahrenheit for 15-30 minutes. After adding several layers to the base form I attached the tusks, ears and a flat backing (to help it hang better on the wall) with more paste dipped paper strips and repeated the paper layering process on them as well. 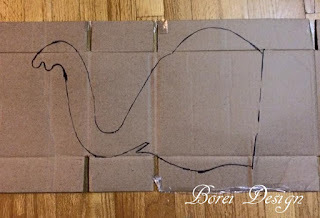 I used scrap poster board paper to make the ears and cut the backing from another cardboard box. I did not use a pattern to create the tusks. I just rolled paper to the desired shape in my hand. 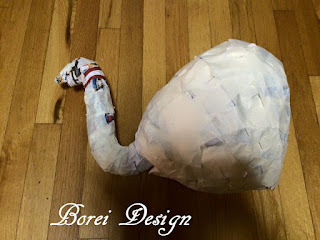 I added about 6 layers of paper strips over the entire form in total (add until your satisfied with the sturdiness of the project) and allowed it to dry overnight. To finish the project I used another roll of wrapping paper in colors that coordinate great in my daughter’s room. I cut it into strips and attached them using Modge Podge. Once they were dry I used acrylic craft paint to paint the eyes and tusks. Once the paint was dry I sealed the entire project with two more coats of Modge Podge, attached a saw tooth hanger to the back with glue and it was ready to hang. My design (which I've named Ellie) cost a me a total $5 to make versus the $128 (sale) purchase price for the one at Anthropologie. I was out of Modge Podge so I picked it up for $4 (using a 40% off coupon) at a local craft store and purchased the finishing roll of wrapping paper for $1 at a local dollar store. I had acrylic craft paint on hand and all other items used were recycled (free) materials. My daughter loves it and I’m super happy with it too. I hope you enjoyed it as well and happy crafting my friends. Oh, this is so fabulous and right on trend! I'm visiting from KnockOff Décor and love how you put this together! It looks just as good as your inspiration! Great job! You should be so proud of how this project turned out! It looks darling!! !